"An easy to make and delectable savory dish that blends a few ingredients into the perfect quiche. It is great heated up the next day for breakfast or brunch." Preheat oven to 375 degrees F (190 degrees C). Press pie crust into a 9-inch deep-dish pie plate. Heat butter in a skillet over medium-high heat; add butter. Cook and stir asparagus in the melted butter, about 2 minutes. Add garlic; cook and stir until asparagus is tender, 2 to 3 minutes more. Remove skillet from heat, adding more butter to asparagus to taste. Season salmon with salt and black pepper; cook with the asparagus over medium heat until fish flakes easily with a fork, about 4 minutes per side. Remove skillet from heat and chop salmon into small pieces. Beat eggs and cream cheese together in a bowl until smooth; add half-and-half and stir. 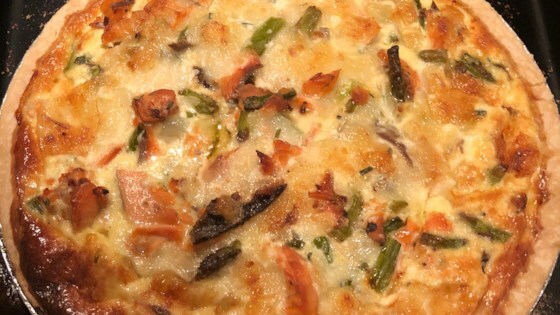 Spoon salmon and asparagus into pie crust and pour in egg mixture, filling almost to the rim. Set pie plate on a baking sheet. Place baking sheet on the lower rack in the preheated oven and cook until a knife inserted in the center comes out clean, 35 to 45 minutes. Let quiche set for 10 minutes before slicing. I find that oven temperatures seem to vary so that is why I suggest checking at 35 minutes. That works fine in my oven but I have a friend who needs to let it go 45. I do salt and pepper the salmon, but don't find a need for it in the filling. I have used skim condensed milk in this recipe and it was okay but would not recommend using regular milk, it does not add the right texture for me.